Beefy is back fighting in Liverpool on Saturday as he comes to blows with Sam Eggington at the M & S Bank Arena - your preview & betting tips with enhanced odds for the Super-Welterweight clash! Liam Smith will be looking to bounce back from last July’s defeat to Jaime Mungia this Saturday, with a win over Sam Eggington in their Super-Welterweight clash at the M & S Bank Arena. 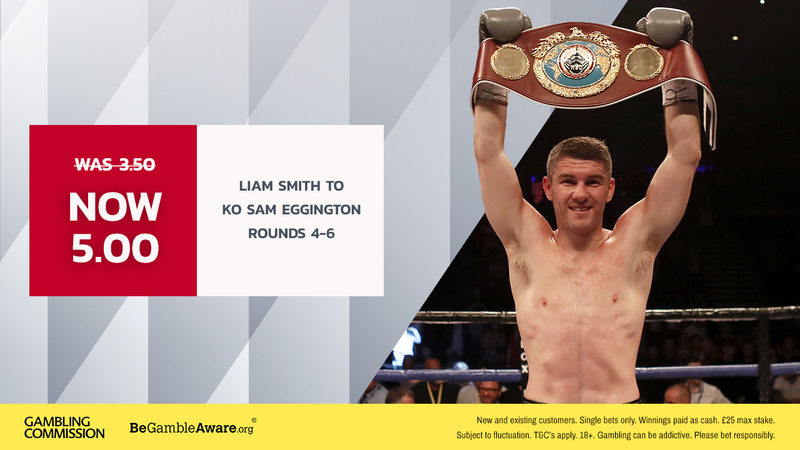 Smith put in a spirited performance, but fell short in his attempt to regain the WBO junior middleweight title he lost to Saul ‘Canelo’ Alvarez in 2016, but will now look to get himself back in the title picture with a win over Eggington. Smith hasn’t fought in Liverpool since 2016, but is undefeated in his backyard and will be looking to continue this run with new promoters Matchroom Boxing. But he faces a stern test in Eggington, who was seemingly on his way to a breakout fight with the fading Brandon Rios, but saw his plans scuppered when Tanzania’s Hassan Mwakinyo stopped him in 2 back in September on the undercard of Amir Khan/Samuel Vargas. Eggington has since bounced back with a distance win over journeyman Sam Omidi in February, but that will have done little to prepare him for his bout with Smith. The fight should be an exciting one; Smith’s impressive offence and Eggington’s relentlessness and durability should mesh well. Eggington’s surprise loss to Mwakinyo was the first time he’d been stopped, and his durability saw him likened to Antonio Margarito by Sky’s Adam Smith. Smith revealed the pair have frequently sparred each other and this could play a huge factor in the fight with the pair being familiar with each other’s styles. There should be no feeling out process as both look to bring it immediately. Smith will look to establish his jab and use it to set up his offence, whilst he is more than capable of holding his own if a fight breaks out, he would be better suited to boxing his way through the contest. Eggington has already stated that he intends for the bout to be brutal, and we know Eggington tends to fight coming forward so why would Smith play into his hands? Especially having seen Eggington’s high punch output neutralised by the boxing of both Tyron Nurse and Mohamed Mimoune. Smith is a massive betting favourite here and for good reason, I’d pick him to win possibly by late stoppage too, simply because of Eggington’s ability to absorb damage. Also on the card is a fight that has taken social media by storm as former GB teammates Anthony Fowler, cousin of former Liverpool striker Robbie, takes on Scott Fitzgerald in another junior middleweight clash. The needle between the two undefeated stars has been humorous as well as eye watering (Fitzgerald ordered a naked elderly man to deliver a message to Fowler via tweet – DO NOT search for that one!) and finally they meet in the ring on Saturday. Fowler has gone from strength to strength under the always-impressive Dave Coldwell whilst Fitzgerald’s has stopped 9 of his 12 opponents. The two have history with Fowler stopping Fitzgerald in the junior ABAs, and Fowler claims he always got the better of the two in their sparring whilst on the GB team so this gives Fitzgerald the chance to set things straight. Also on the card is Liverpool’s favourite heavyweight David Price who faces the undefeated up and comer Kash Ali. Price picked up a stoppage win over Tom Little in December as he looks to force his way back into the heavyweight picture following back-to-back defeats against Sergey Kuzmin and Alexander Povetkin. Price has promised to ‘destroy’ Ali, whilst Ali claims he will send Price into retirement, so expect fireworks from the big boys. Also on the card is a British and European junior welterweight title clash between Joe Hughes and Robbie Davies Jnr and Olympian Natasha Jonas also makes an appearance too.